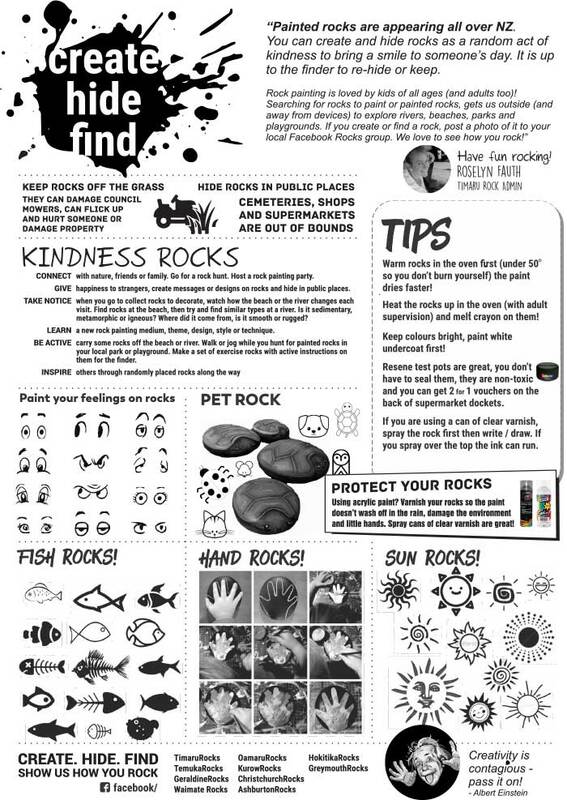 Feel free to download our activity sheet for a few tips... and design inspiraiton! The idea is to paint some rocks and hide them in places around Timaru for others to find, re-hide or keep. The Friends of the Aigantighe Art Gallery are proud to support the rocking craze by recieving donations and hosting events. Creativity is a great way to bring our community together to celebrate the love of arts. Painted rock hunting: It's the latest craze to take over, not only our spare time, but social media too. You may have seen a few photos flash up on your Facebook feed as people around the country and the world are painting, hiding and seeking out decorated rocks. It's a cheap and easy activity for families, adds fun to a simple walk and has so many added benefits! You can be a painter, a finder or both. Decorated rocks are hidden outdoors - at playgrounds, in parks, on bushwalks, at the beach - pretty much anywhere (whilst avoiding private property and sacred places like cemeteries). The rocks are labelled to connect them back to a Facebook group where members can show off their finds. It's a modern treasure hunt. We have two community rocks box's that you can borrow for your group to create rocks for us to find. Full to the brim thanks to loads of generous business's in Timaru including the Oxford. 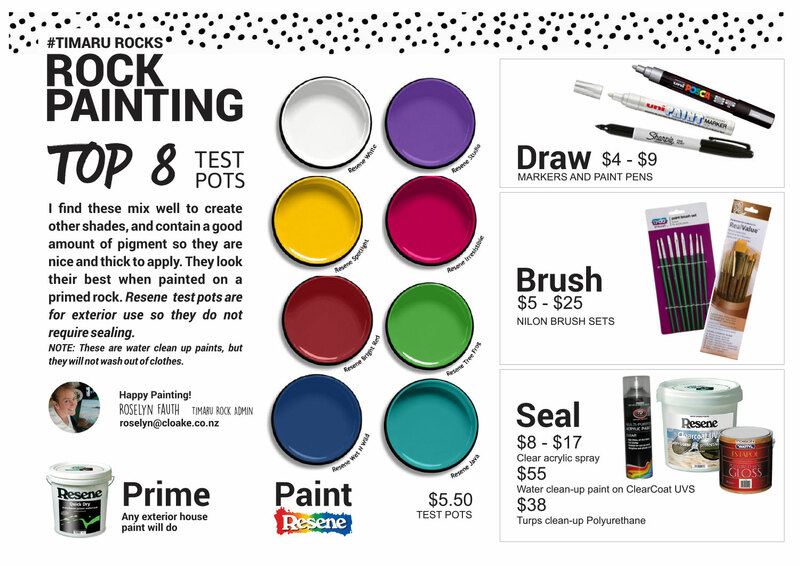 You can also now borrow two extension packs, a Fluro Rock Box Kit and a Dotting Rock Box kit. The council is notifying their contractors, and just wanted to remind us to hide rocks away from areas that could be picked up by lawnmowers, not too close to waterways, or at the cemetery. 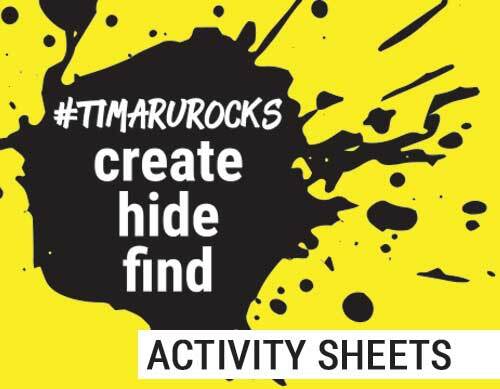 Here is a summary of hiding spots in Timaru! Cemeteries are out of bounds. Keep rocks off grass so they don’t wreck a council mower, or flick up and hurt someone. Seal your rocks to handle the rain/frost. (use a spray or paint on varnish, don't use ModPog or glues like PVA, they go gluey when wet) Resene test pots are ideal for exterior use and don't require sealing. 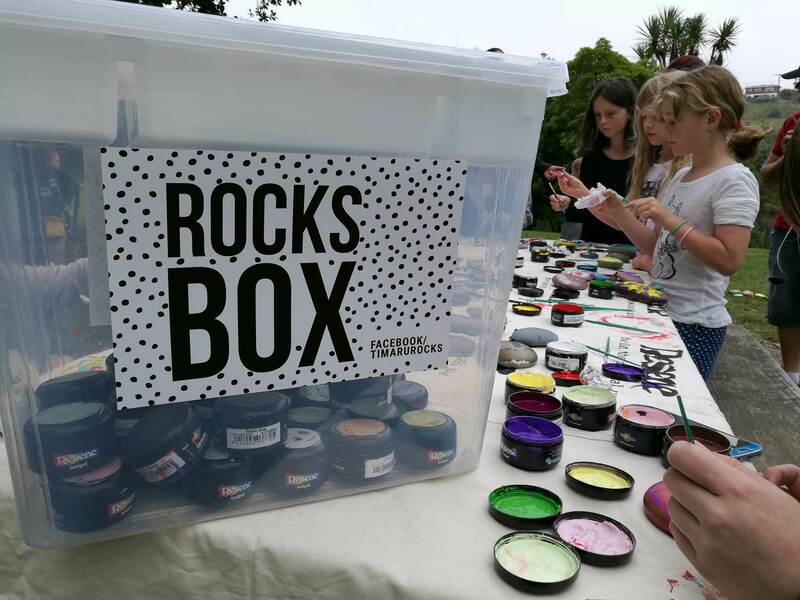 Please make a donation to help us keep our rock boxes topped up, and provide events for Timaru Rocks. Please include your name as a reference and "Rock" so we know who the funds are from and what they are for).